Intermatic ST01 with opaque panel door which opens for programming and battery (unit protrudes slightly from the wall). Round dial timer Mechanical dial timer (rotary dial is used for programming but does not turn during normal use. Mechanical timers for pumps, lights and more. These have many variations to suit the application. Press to manually turn lights on or off without upsetting the settings. Handles only 500 watts or less of light. Memory of 15 minutes without power, then you need to reset it. Minimum wattage: 40 watts. This means that you cannot use low wattage fluorescent screw-in bulbs. Helpful Hint: There is a red indicator light on the timer. In normal operation (not programing mode) the red indicator light shows the status. Flashing: The program has been lost, perhaps due to a power failure of over 15 minutes. Off: The timer may be in Manual mode. (see below). Or, all the bulbs may be burned out. On: Timer is in automatic timer mode. Press the button twice quickly. This is how you change from 'Timer mode' to 'Manual mode' (without losing the memory of the program setting). Repeat to return to the other mode. Perhaps someone changed the mode accidentally. Make sure the light bulbs are good. 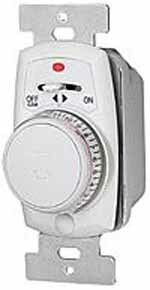 (You need a least one working bulb (over 40 watts) for the timer (and indicator light) to work. Try reprogramming the timer. If this doesn't do it, call us to replace it. Slide the control lever to the left to Off-Clear for at least 5 seconds. The red indicator light will go off and any program settings will be lost. Move the lever to the right to On. Red indicator light will start flashing. Rotate the clock dial (at least 1 click) to the 1/2 hour closet to the present time. Be aware of AM and PM. Be sure not to accidentally press the button while rotating it. Press the button in once to enter (set) the current time. The Red indicator will go Off. Press push button to enter the ON time. The controlled light will turn on. Rotate dial to the desired OFF time. Press dial to enter the OFF time. The controlled light will now be off. Repeat steps 5-8 if you wish to set another automatic time, for example an early morning setting. Continue to rotate the dial for at least 24 hours (2 full turns) from the first ON time to complete the programming. The Red indicator light will come on and stay on. Note that the dial will not turn automatically to indicate the current time of day. The clock indications are only for programming purposes. You can go to the manufacturer's web site has instructions but they may be hard to decipher. 'AA' battery prevents loss of settings during power failures. or the web page document view. This timer automatically adjusts for daylight savings time and changing sunset/sunrise times so you don't have to reprogram during the year. Programming: Click here to review basic programming instructions. 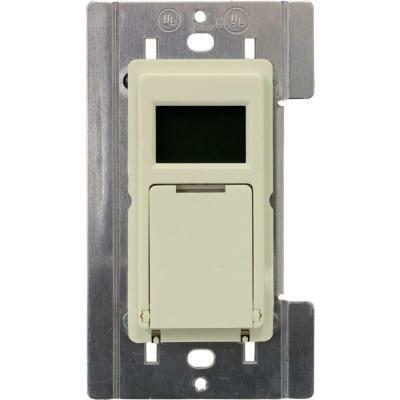 Programming: Click here to review detailed programming instructions. This timer automatically adjusts for daylight savings time and changing sunset/sunrise times so you don't have to reprogram during the year. Press button to manually to turn on and off. If you press and hold the button, it will change modes from "Auto" to "Manual", to "Manual-Random" to "Program". Programming: Click here to view the manufacturer's list of instructions by model (pdf file). 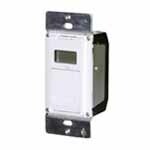 T1033 Digital timer without calendar feature (requires neutral wire) for heavier loads (up to 2400 watts) or fluorescent lights (can be less than 40 watts). 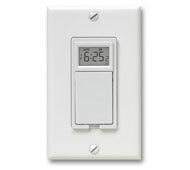 T1035 Digital timer (requires neutral wire) with calendar feature. Due to their large size and unsightly appearance, they are usually located in the basement or garage. Manual by-pass is harder to do, or separate switch must be added. Able to handle large loads like pumps, 240 volt situations and more. Able to interact with photo-cells and other options. Easily set and changed but has no power failure memory backup. 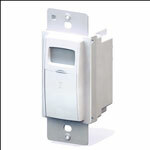 These X-10 transmitter units send signals on the household wires to wherever there is a X-10 remote receiver switch.